Currently 4th from bottom in League 1, so work to do. Hope both of them stay fit & do well. Last edited by SuperSAINT; 30-08-2018 at 03:12 PM. Excellent - we can play against them in the next round of the Carabao Cup....! Got to be pleased for both. Hesketh is too good for U23 football & Flannigan has had a horrendous time with injuries. Also free's up a couple of spaces in the youth teams. Flannigan's not featured much, but Hesketh starts every game so will be interesting to see who steps up. 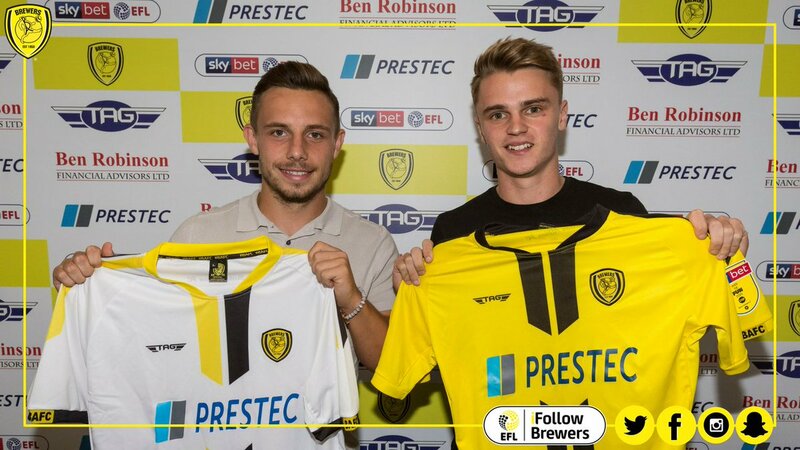 I hope they both do well at Burton. Good move for both. It will be interesting to see how they get on at Burton. Hesketh is far too good for U23 football. Good luck to both of them. I think Flannigan can be a very decent lower league footballer - if only his knees hold out. Hesketh is 22 going on 12. Smaller players than him have succeeded, but he seems seriously hampered by his lack of physicality - at least in the games I've seen. It's a great pity as he's got an eye for a pass. Hopefully a season of men's football can bring him on. Good luck to the pair of them. Would've thought Hesketh was better than that, but hopefully a run for them and he'll be ready for at least Championship next season. I thought Flannigan was only being kept on for sentimental reasons after a serious of nasty injuries. Hope he does well too! So we just need to loan/sell one of: Rose and Barnes? That would put us at 25. Unlikely to loan Rose, no need to loan Barnes, just don't name him in the PL squad (same as Rose). If we can get Forster out we can even name them in the squad. *puts on MLG hat* Actually OttawaSaint a clock is analogue whereas I posted in digital format. John Boy Saint from the County Town of Pedantry in the Shires here............ but even a digital clock without a analogue display still has workings to make it work and tell you the time, so that's still clockwork because it makes the Clock Work. It did occur to me but I figured **** it. He may do eventually. But right now he's hardly played any senior football at all. And when he did, he left in tears after 20 minutes. League one is fine for him. He's barely played any first team football & is 22 now. Fingers crossed Clough can get the best out of them. Glad to see hesketh go out as was clear he wasn’t fancied by Hughes. Hope Clough can get the best out of what imo is a player with a lot of talent. Last edited by Baird of the land; 30-08-2018 at 09:11 PM. Maybe the physicality of League 1 can toughen Hesketh up a bit, and hopefully Flannigan can prove his fitness and get back on track. I would imagine it's the last chance saloon for Flannigan. If he doesn't succeed at Burton he will not get another contract from us. I'd still like to see a few more go out. Obviously it's in everybody's interest for Forster to go somewhere, but possibly Slattery and one of either Johnson or Tella to find out if they can handle proper competitive games where they have to fight for a chance to play each week. Never been impressed when I’ve seen Hesketh play. Lallana was a late bloomer and started in the Championship but wasn't great. Had 2 great seasons in league 2 and became the player he was. Hopefully Jake does just as well. No I wasn’t, though I was at Beer Sheeva where he was completely out of his depth and dragged off after 30mins. That is not strictly true Le God, please see EFL Carabao Cup regulations section 6.3. They would be eligible if we gave written consent for them to play. League One is a massive step up from the U23 PL Second division. Really hopeful that this is a big year for Hesketh. He's got loads of ability. Hesketh came on in the 2nd half. Burton won 3-0. 2-0 nil before he came on. Hopefully he was involved in the 3rd. Seems Jake had a day to forget. Burton fans saying that was one of the worst substitute performances they've seen and he was lucky not to have gifted Wimbledon at least 2 goals. Hopefully just nerves. Odd as the burton match thread I was looking at described him as looking like a great addition. Nice to See he played 90 minutes as burton beat Burnley. Sounds like he's developing quite well. Nigel Clough says Jake Hesketh will be pushing for another Burton Albion start on Saturday after impressing in Tuesday's defeat to Southend United. The Southampton loanee was named in Albion's starting XI for a League match for the first time against the Shrimpers, having played a key role in the recent Carabao Cup triumph over Burnley. He was a constant attacking spark during a dominant first 45, stretching Southend on both flanks as he and David Templeton swapped wings. One powerful drive from the left was brilliantly tipped onto the crossbar by Shrimpers goalkeeper Mark Oxley, and he curled another ambitious effort just wide after the break, when a flat Burton performance allowed Southend to battle back and win 2-1. Still, Hesketh's display means he is likely to be competing with Marvin Sordell - who start Burton's first nine League games of the campaign - for a right-wing slot against Wycombe Wanderers this weekend. "He was very good tonight, Jake," said Clough. "It's a toss up between him and Marvin out there (Sordell was rested on the bench after being ill). "But Jake did really well against Burnley. He's still building up, he's a bit short of match fitness so we didn't think he was right for Tuesday-Saturday-Tuesday. "He has done very well again tonight and he'll be in with a shout for playing on Saturday. "I think he has improved, each game he's got a little bit better as he's settled in. "He's only a young player without much football in the last couple of years, but he works his socks off. "I think the supporters love the whole-heartedness of the way he plays. "It's a nice contrast. We've got him on the right tonight and Temps (David Templeton) on the left who caused so many problems in the first half. "It's all to no avail when you don't finish them off." Being a part time Shrimper and watching their forum last night, the view on there was that he was the stand out Burton player, constant thorn in Sarf Ends side. Good stuff. Slowly gotten himself into contention, playing well & getting fitter. I hope he got a good scumming! Good on him. I still think he can make an impact at the top level and I still rate him a much more skilled attacking player than Ward-Prowse. Great goal. Shades of Le Tiss v Russia B. Just about to say that. It genuinely is my favourite moment of the season so far. What better than Hojbjergs last minute nerve settler against Crystal Palace, I don't think so.